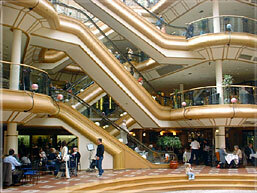 Glasgow's newest and friendliest shopping centre. Buchanan Galleries is the newest and some say the best shopping centre in the heart of Glasgow, Scotland’s shopping capital. Positioned at the junction of Glasgow’s famous Sauchiehall Street and Buchanan Street, Buchanan Galleries is right beside rail, underground and bus stations. The shopping centre has its own award winning 2000 space car park only minutes form the M8 Motorway and is easily accessed from all directions. 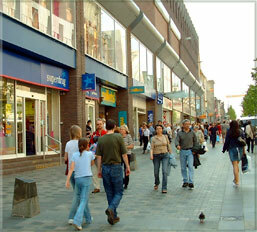 Buchanan Galleries provides Glasgow residents and visitors with an unequalled shopping experience. The superb choice of our 80 quality shops, including the John Lewis Department Store, H&M, Habitat, Mango, and Next, ensures that customers have the best choice for fashion, clothing, accessories and gifts galore. The largest shopping centre in Scotland and Europe’s largest glass structure. The St. Enoch Centre, still the largest glass structure in Europe, prides itself on being a fun, family, and most of all friendly Centre catering for all age groups and tastes. 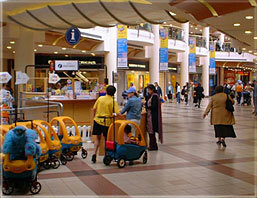 We have a wide variety of shops including large department stores such as Debenhams, Boots, TK Maxx and Bhs. The kids can enjoy our Kids Play Area and Kiddy Cabs and older kids can enjoy our two-man ride simulator. 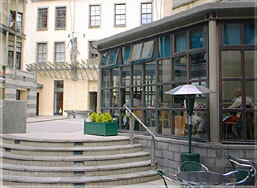 If you fancy a bite to eat or just even a coffee why not visit Scotland's largest Food Court. With over 850 seats and a wide range of food outlets including KFC and McDonalds we are sure you won't be disappointed. 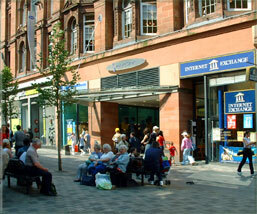 55 St. Enoch Sq., Glasgow. A uniquely elegant and entertaining shopping experience. A fashionable and very elegant shopping centre housing a cosmopolitan selection of designer names, exclusive boutiques and cool cafes and bars under a Art Nouveau glass roof. Look for the Scottish Craft Centre, which has an outstanding collection of work created by some of the nation's best craftspeople. One of Britain’s oldest covered shopping arcades, built in 1827. 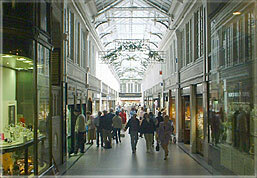 Argyll Arcade is a covered street which has the biggest selection of 32 jewellers shops all under one roof. John Baird takes the credit for its ornate iron-framed hammerbeam roof which is as pleasing to the eye as the glittering contents of the shop window displays. The L-shaped arcade was built in 1904 and to this day houses an array of local jewellery designers' shops as well as antique jewellers' shops. World famous names - wonderful atmosphere - not to be missed. A selection of the finest Italian designer stores and the UK's first Versace store, with pavement cafes completing the centre's cool and contemporary theme. A new and very refreshing approach to shopping. Situated in the area east of George Square in the city centre which used to be the hub of the trade generated by the city's rich 'Tobacco Lords' lies the Merchant Square shopping retreat. With exclusive shops, restaurants and bars this indoor shopping centre is fast becoming one of the most sought out destinations for shoppers looking for a refreshingly relaxed and retail experience. The square offers small arts and crafts outlets ideal for the visitor looking for a unique gift to take home. Great brands and great choice in prime location. 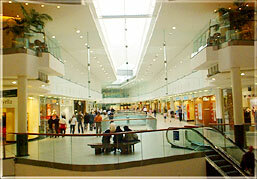 This recently refurbished - and always popular - shopping centre on the north side of the city centre houses a number of the regular mall shops such as Superdrug and WH Smith, as well as some more unusual ones like TK Maxx and Primark which aim to bring you top-notch brand names at discount prices. Well worth a visit and is surrounded by loads more great shopping destinations. A more offbeat shopping arcade, with an interesting mix of antique and craft shops, designer homeware boutiques and vintage record shops, together with cafes and bistros dotted around the city's cool West End. Great for costume jewellery and memorabilia hunters and whether you are browsing or buying, collector or dealer a visit to the Victorian Village Antiques is a must. This arcade of individual shops has an interesting and impressive range of antiques for everyone. 93 West Regent Street, Glasgow. A historic marketplace that's sure to surprise! An eclectic mix of covered and open stalls selling a huge range of goods from antique furniture to computer games. 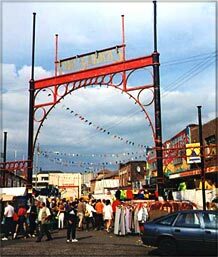 The Barras has gained an unenviable reputation for selling counterfeit videos, CDs and DVDs of dubious quality, often available there before anywhere else in Europe. Worth a visit if you're in the city over the weekend, but beware that it's definitely at the lower end of the Glasgow shopping experience in terms of quality of material services - but it does have great character and the ever-present opportunity for a genuine bargain. A wide choice of cut-price bargains from small, independent retailers. 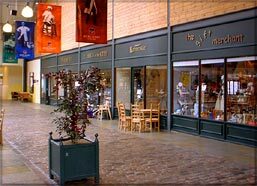 Not far from the Sauchiehall Street Shopping Centre is the Savoy Centre where you can stroll through 2 levels of small shopping outlets which a huge range of bargains on offer from paintings of Glasgow to cut-price videos, jewellery and furniture.